A vintage 1909 Northern Pacific Railroad Locomotive sits next to the historic Bread of Life Church, which is North Dakota’s oldest remaining church, completed in 1881. Camp Hancock (originally Camp Greeley) was established in 1872 as a military post and supply depot to ensure expansion of the Northern Pacific Railroad. 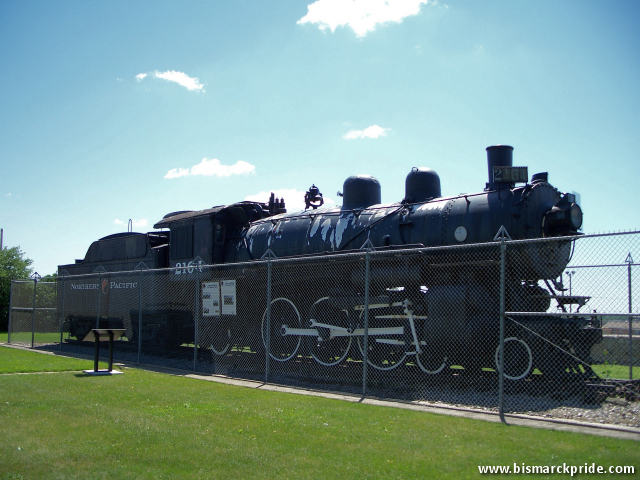 It contains the oldest remaining building in Bismarck, along with the historic Bread of Life Church, which was completed in 1881; and a vintage 1909 Northern Pacific Railroad Locomotive that was donated to the site in 1955. Camp Hancock also housed the U.S. Weather Bureau until 1940.